The project, once slated for a 2020 opening, has now been pushed back to 2025. Design and engineering, which had been finalized, will need to be redone for parts of the project. Mayor Jenny Durkan wants to build a streetcar line along First Avenue in downtown Seattle, the long-planned project she put on ice nine months ago, but increased cost estimates and a funding gap mean the project’s future is not secure. The project, once slated for a 2020 opening, has been pushed back to 2025. Design and engineering, which had been finalized, will need to be redone for parts of the project. 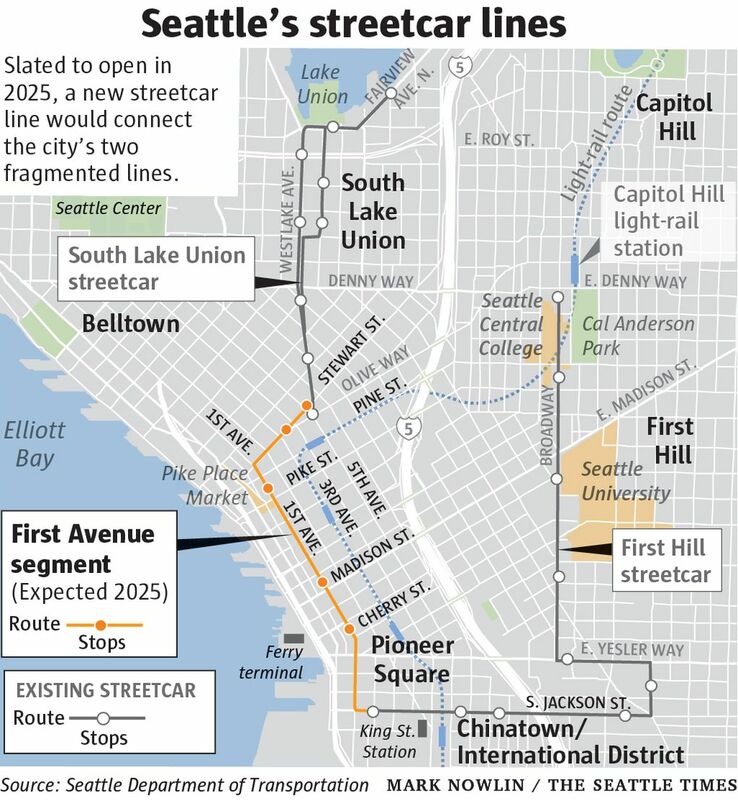 The city estimates the total construction cost of the streetcar expansion, which would connect the city’s existing but separate South Lake Union and First Hill streetcars, at $286 million. In 2015, the city had estimated the cost at $143 million; in 2017 it estimated the cost at $197 million; and in August it estimated the cost at $252 million. About $78 million of the most recent estimate is for underground water and electric-utility work. Much of that work would have to be done at some point anyway, whether the streetcar is built or not, but with the city Department of Transportation digging up First Avenue for streetcar work, it makes sense to do it at the same time. The newest cost estimate also includes up to $17 million to modify existing roadways and maintenance facilities to accommodate the larger streetcars that the city ordered for the new project. Durkan connected the expanded streetcar with the other projects underway around downtown — the teardown of the Alaskan Way Viaduct, a new 20-acre waterfront park, an expanded convention center and a renovated KeyArena. Businesses downtown and in the Chinatown International District have urged Durkan to restart the project, arguing that it will provide a needed transit connection between the north and south edges of Central Seattle. The city’s two existing lines, which do not operate in dedicated lanes, have lagged behind ridership expectations and have proved, at times, hazardous to cyclists. Durkan’s approval does not mean construction of the streetcar, which would operate mostly in its own lanes on First Avenue, is assured. There is a projected $65 million shortfall between the latest cost estimates and the money that the City Council previously budgeted for the project. Durkan said she would work with the City Council to find funding to get the project built. And while the previous mayoral administration hoped to open the new streetcar in 2020, it wouldn’t open until 2025. Part of the reason for the delay is that the project will have to spend more time under federal review to qualify for an expected $75 million grant, city officials said. This longer review timeline “subsequently escalated construction costs,” the city wrote in its latest project analysis. Durkan said the speedier timeline developed under Mayor Ed Murray was “absolutely unrealistic,” and faulted the prior administration for beginning utility work on the project without securing federal funding. 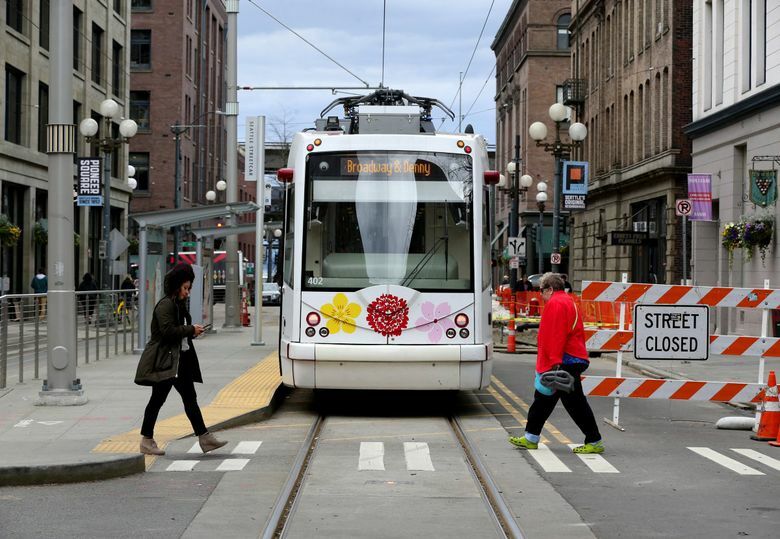 Durkan halted the project and ordered an outside review in March, after a Seattle Times report that the cost to operate the new streetcar system could be 50 percent higher than the Seattle Department of Transportation (SDOT) had previously said. An independent consultant’s review, released in August, found that SDOT’s lower cost estimates “appear to be reasonable,” but the city’s latest estimates foresee much higher operating costs. SDOT had previously estimated $16 million annual operating cost, while King County Metro, which operates the streetcar for the city, had estimated $24 million annual cost beginning in 2020. The latest estimates foresee $28 million annual operating cost beginning in 2025. The city had previously ordered 10 streetcar vehicles, from a new manufacturer, for the expanded system. Those streetcars, costing $52 million total, are each 9 feet longer and more than 20,000 pounds heavier than the streetcars the city uses. Over the summer, Durkan had cited the larger vehicles as potentially being incompatible with existing tracks and maintenance barns. A new report, prepared by the Parsons engineering firm and dated this month, says those larger vehicles will force $11 million to $17 million of modifications. That includes about $5.7 million to expand the South Lake Union streetcar maintenance barn and about $1 million to lengthen five station platforms and adjust the wishbone-shaped end of the trackway where streetcars turn around. It also includes somewhere between $4 million and $11 million to strengthen five bridge structures underneath South Jackson Street, between Third and Fifth avenues, to accommodate the heavier vehicles.